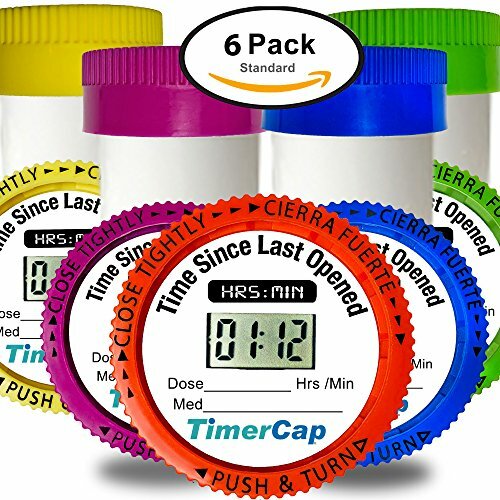 TimerCap pill reminder bottle cap is an easy to use device that helps you stop worrying if you or your loved ones are taking medication as needed. It is the perfect medicine organizer that lets you manage your pills in its bottle and keep your prescription label and safety information at your fingertips. Medicine organizer is the perfect way to seamlessly coordinate care for children, teens, elders or pets as you will always know when the last dose was taken, even if someone forgets to mention it or write it down. TimerCap provides the peace of mind of knowing your loved one has received their medications as needed. TimerCap pill organizer case protects the patient and their family. Since it is tamper resistant and resets every time it is opened, it is the perfect tool to deter abuse, theft and medication mistakes. Included in the kit are caps, tracker forms and bottle labels for your convenience. Have you ever forgotten a dose? Download our free TimerCap app for medication reminders to your smart device. TimerCaps and bottles are also easily transported and allow you to keep the prescription labeling information with you at all times. The batteries last 12-18 months. Stopwatch: Daily medication organizer automatically shows when medicine pill bottles were last closed, helping you to avoid medication mistake or a potential overdose. Stopwatch helps you stay informed if others have opened the bottle. Easy, Safety & Comfort: Whether you are living with long-term mobility challenges, recovering from surgery or addressing safety issues as you age, pills case creates home care products to help you achieve the easy, comfort & safety you deserve in your home. Enjoy convenience: Using a 6 Pack TimerCap daily pill organizer means you do not have to search through your medicine cabinet each day-or several times daily-to find the correct medications and read the dosing instructions. Pocket, Purse & Travel: Great pill bottle cap for your pocket, purse or travel bag. Take it with you wherever you go. Stay anxiety free with easily portable bottles that have medication information. Makes taking your medication simple. Care for: It is the perfect way to seamlessly coordinate care for children, teens, elders as you will always know when the last dose was taken, even if someone forgets to mention it or write it down.